College Dorm Basket is a beginner pattern with a woven wood insert in center of rectangle shape. Requires a 6" brass or black wire handle. Kelly’s Market Basket is a basic shape with a delicate woven trellis design on the side that is woven into the top braid. Small Harvest Basket is a round pattern with decorative base layout. Requires 2-2"X 5" double notched side handle. Double Walled Basket has two bases and two walls up the side. Inside woven pattern is different from outside woven pattern. Apple Basket on Wood Base is woven on a mold. A take off of the Nantucket pattern. Requires a 8" wire handle. Hearth Basket is ever popular for along side the fireplace for small kindling wood or pine cones. The built up sides create a great shape. Diagonal Twill weave is a more difficult pattern with a unique base into sides weave. Black Ash Basket is woven on a stand and rectangle shape mold. 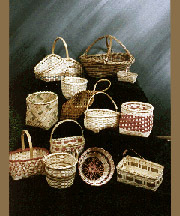 A small basket that requires a 3 ½" X 4" carved handle. Spring Time Wall Basket is great for hanging. Has decorative flowers and leaves looped on the front. Swirled Base Basket has beautiful decorative base layout. Designed with beads and dyed reed accent on sides and finished with top braid. Oblong Cathead is made without a mold. Hand carved ears and swing handle accent this beautiful basket. Hanging Door Knob Basket is a little harder to learn, but once the pattern is learned it is a quick pattern to make up for gifts. Old Shopping Basket is several forms of twining. Dyed reed used makes a lovely pattern up sides. Contains two build swing handles.